Photo credit: Reuters / Mike Segar. 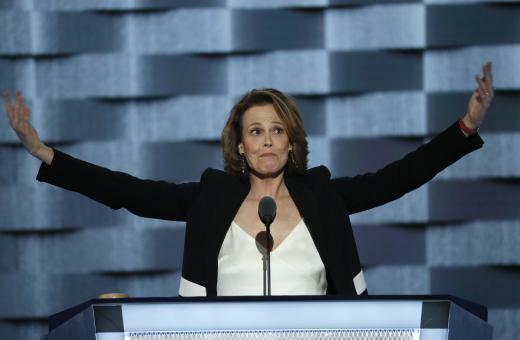 American actress, Sigourney Weaver, has launched a scathing attack on Donald Trump. She is lambasting him for his views on climate change, which he calls a hoax. Weaver made the statements when addressing the Democratic Convention (DNC), as the Democratic Party formally announced that Hillary Clinton would be the party’s presidential candidate. She spoke as she was introducing a pro- Democratic Party short film on climate change, made by Titanic film director, James Cameron. The Alien star, who identifies herself as an environmentalist, said that climate change is an urgent problem which must be addressed here and now and that it is not a far- away problem that might affect Americans in the future. “People’s life is affected by climate change” she stated, and emphasised, “our future is at risk”. She cited examples of climate change and its impact on, for instance, a rancher in Texas who is losing his cattle because there is no grass and a farmer in Kansas whose crops are dying because there is no rain. Many to the left part of the Democratic Party, many of them Bernie Sanders supporters, have concerns about what Hillary Clinton’s response to climate change will be if elected. Even with the top billing that climate change claimed on the last day of the DNC, not everyone is convinced. Filmmaker Josh Fox, hardened Bernie Sanders supporter and Clinton critic, tweeted that Democrats who support fracking are also climate deniers, thereby calling Clinton a denier. However, Weaver`s message drummed home the Democratic climate change message and flooded the internet with climate change articles. The party is adamant in stressing ,that with Clinton at the helm they, unlike the Republican Party, would not only make sure climate change is addressed but also that it remains a top priority. All eyes will now be on the Clinton camp as her Presidential campaign and she starts to unveil her climate change and energy agenda.